The measuring system enables the evaluation. 4-stroke internal combustion engine for the practical education. The 4-stroke engine which is well known for many years in laboratory practice was equipped with a piezo-pneumatic valve actuator. The performance is controlled with the mouse pointer of the PC during running. The engine is incorporated in a test rig whose control, data acquisition and data display is exclusively executed on the PC. The real-time data acquisition includes the permanent indicating with displaying in p/V or p/? - diagram and with the calculation of the averaged indicated pressure. The engine base is a mono-cylinder with 70 ccm stroke volume and a compression ratio of 1:4. The cylinder wall is glass. The piston runs dryly. The connection-rod bearings are dryly running needle rollers. The transparent design of the engine allows observation of crankshaft, piston, valves, ignition and combustion. (Figure 1). The auxiliary pressed air flow is conducted by a way-valve that is driven by a piezo-actuator. 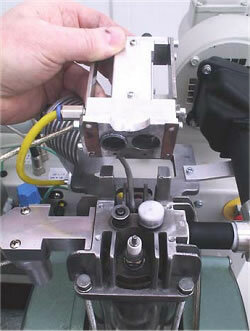 The high flow-rate of this fast way-valve makes this functionality possible. the intake for comparison. Reducing the pressure of the auxiliary air from 2,8 down to 2.0 bar effects a reduction of the valve lift and thus a reduction of the time opening square. The electronic ignition is also fully variable in terms of timing and dwell. The upper panel of the software screen contains the control elements (Figure 2) : A status- and a speed shifter control the engine performance. The engine needs a high resolution field of characteristic data sets for all operation conditions. These have to be elaborated by the student and are saved as data files. With loading of such a data file the engine is immediately driven into the operation point, including the set speed. The control elements for saving and loading can be found in the control panel of the screen. (Figure 2). 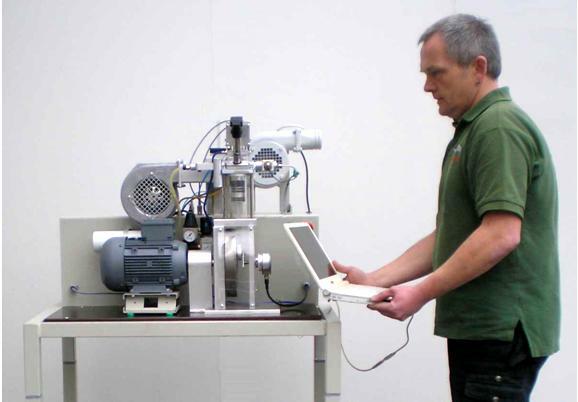 Important part of the test rig is the directly coupled electric motor/generator. A special elastic shaft joint governs the extremely disharmonic force transmission of the mono-cylinder. The electric motor/generator is in swivel bearings and has got a torque adaptor which is combined with a force sensor. The electric engine governs the combustion engine and functions as power absorber and engine starter. The engine needs an additional piston cooling by an air ray similar to the piston cooling with oil spray. This is automatically controlled by the test stand depending on exhaust temperature and power. The exhaust gas is cleaned by a special catalytic converter. A fan leads the exhaust gas through a pipe and a flex hose to the outside. The data acquisition captures 40 samples of each non-indicated measured quantity per revolution. The quantities value is equal to the arithmetic average. The resolution for the indicator diagram is 200 values per power cycle. The control timing actions are refreshed 400 times per power cycle. All measured quantities as well as the derivative quantities power, specific fuel consumption and average internal pressure are displayed by bargraphs. A fast refreshing table displays all quantities as exact digitals. All values can be selected for plotting. An extraordinary feature is the test stand's indicator mode which works simultanously to all other functions. The data is displayed on a software-oscilloscope. Figure 3 shows a minimized p/alpha-diagram and an enlarged one in figure 5. The indicator diagram can be configured as p/? or p/V diagram with optional focus on the gas exchange phase ((Figure 7). Indicator diagrams can be saved with the indicator diagram browser, presenting the recently captured diagrams for further evaluation. Stored data files includes the values of all quantities, especially the control timings. A powerfull export function provides easy export to external software. The software package includes powerfull functions for the post editing of recorded data and preconfigured evaluation templates (Figure 8). 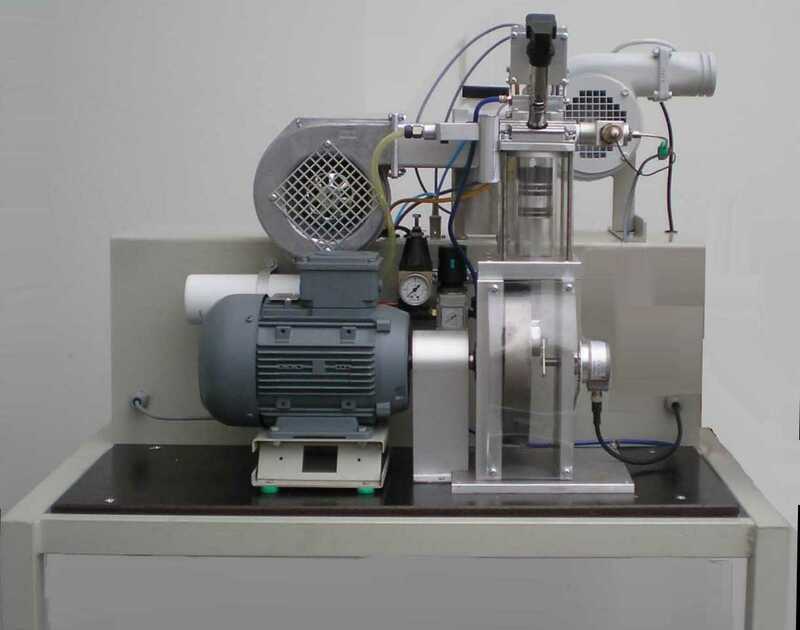 The test stand is called „Engine technique stand“ to demonstrate, that it presents the final modern technologies on a small base of 1 m²: Fully variable valve actuation in combination with extraordinary operation and data acquisition including indicating with pc.